52C is not horrible, if playing demanding game. thanks for the reply as i mentioned above its an amd athlon x2 7750 2.7ghz the ram is ddr2 pc2-6400 800mhz 2gigs worth it has a 300gb wester digital caviar sata 3.0 276gb free space and symantec antivirus this is a brand new build only had it together for a week and the game i was playing is world of warcraft hardly a demanding game. 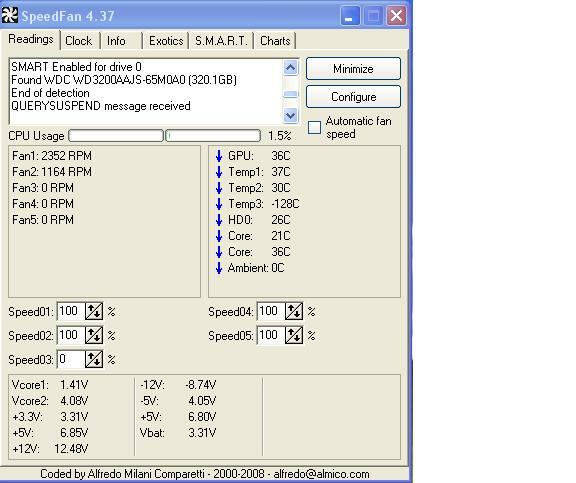 also the fan speed is at 2678rpm at that temp seems low speed to me. when the screen freezes a loud constant scratchy screechy noise comes out of the speakers and you cant do anything until you restart the computer. ive swaped out the video card thought that might be it still did it. didnt know if it could be the ram i havent done a memtest on it yet any help would be appreciated. Your processor max temp is listed at 70C, so I don't believe, you have overheating problem. okay never mind on that last post i figured out how to do a mem test any other suggestions though? Well, run it for a few passes (overnight? ), and we'll go from there. i did a mem test and it came back with no errors where should i from there? What is the CPU temperature, when you just turn the computer on, doing nothing else? idle temp was around 42 i think according to pc probe. I think, it's little bit high for the desktop, while idle. When was the last time, you cleaned the inside, using compressed air. caused by ntoskrnl.exe, may indicate RAM issue. Are you sure, you have correct RAM installed?